Preheat oven to 350 F. Grease a muffin tin. Place eggs in a bowl and beat. Add applesauce, vanilla, and water. Mix well. Mix dry ingredients together in a separate bowl. Gently pour into wet ingredients. Mix only to moisten dry ingredients. Let batter sit 10 minutes. Pour into greased muffin pan and bake for 15 - 20 minutes or until toothpick comes out clean. 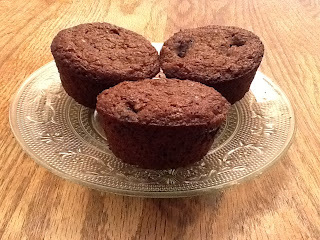 Remove muffins from pan and let cool on cooling rack.